It’s partly my own fault, I should have put in more and stronger fixings than were supplied. Hindsight is a wonderful thing, and informs us about what it was we should have done. I’ve rescued the seedlings as best I can and now I have to find the cash to build a new greenhouse double quick as the growing season is upon us. I’m a part time wage earner since the crash I was in a few years ago and this is a bit of a blow. If anyone feels like helping towards the £430 a replacement will cost, the donate button is top left. Thanks for your consideration. Have you got their phone number? Gosh – that is a huge blow (sorry about the pun) at this time in the growing season. As a cheaper and faster option, perhaps get a couple of polythene tunnels made for raising seedlings. Then you can get a more secure greenhouse for later. Thanks CM. Recovering the polytunnel was already on this years things to do list. If I wasn’t such a busy blogger I might have made a better job of fixing the greenhouse down in the first place. Hey-ho. Humm. Where’s “Big Oil” when you need them? As part of the “highly organised and well-funded fossil fuel denial industry”, I thought your paymasters would cover you for this. Oh wait a minute, I’ve been reading too much Realclimate and Mann’s tweets. (never let a machinist build stuff) I used over 400 1″#6 sheet metal screws to hold the alum frame to the wood inner frame I had to cut each piece to fit after assembling the alum structure. leaped on into summer here in Mesa, Az. Thanks to some outstsanding kindness and generosity, I am just over halfway to covering this calamity. I’ll be following Richard Holle’s lead and building a wooden frame inside the replacement structure to make sure it doesn’t happen again. I used 6 lbs of 3 1/2″ deck screws to put the wooden frame and shelves together, and used 15 tubes of silicone caulking to glue and seal the panels onto the frame. Has with stood 38MPH wind gusts so far, have about 400# of water in the trays on the shelves plus the weight of the shelves and plants as a stability feature, (not a bug) to keep the humidity above 55%. The uprights I added are sitting on blocks that transfer the weight to the channel Iron frame. I read the online evaluation of the harbor freight green house kit, and saw a lot of peeps had wind problems in open conditions, as the kit came originally. Took an extra month at a couple hours a day construction time, cutting, fitting, and dadoing in the alum cross braces to the wood pieces as I added them. Cost me most of my online time in December and January getting it done, put the glazing on last. [I have a nephew that works in IT for the company offices at one of the Koch brothers companies, but I only have his personal cell#] No money flows between us, but I left a lot of hand tools, and farm equipment with his brother, (who lives 2 miles South of the old farm) when I moved off of the farm. He still has a couple tons of my old rock collection waiting for me to pick up some every time I visit. Minor pensioner-style donation sent. Happy rebuilding! Sorry to hear this. Awful news, terrible timing. Hope you are well on your way to repair. George, the big tidy up starts in the morning. Then some measuring and planning. Thanks for your assistance. [Reply] Heh, I wouldn’t give a tenner for one of those. 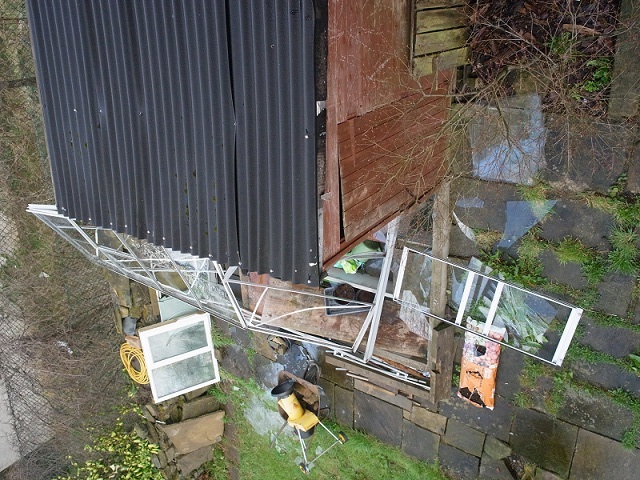 Has the image of the greenhouse been rotated or inverted? plie of glass, plastic and soil-with about 2cm of mixed hail and ice pellets on the remains.